For us non-millennials, these fruit and nut granola bars are going to take some serious getting used to. It’s not the flavor that might be alien to us, but the nutrient profile. One bar (albeit a hefty one) contains one quarter of your daily fat allowance. The fat content of these bars is enough to make most Gen Xers quiver in their boots. So why on earth do I have them on my healthy food and nutrition blog? Read on to find out. replaces other less healthful foods like refined carbohydrates. 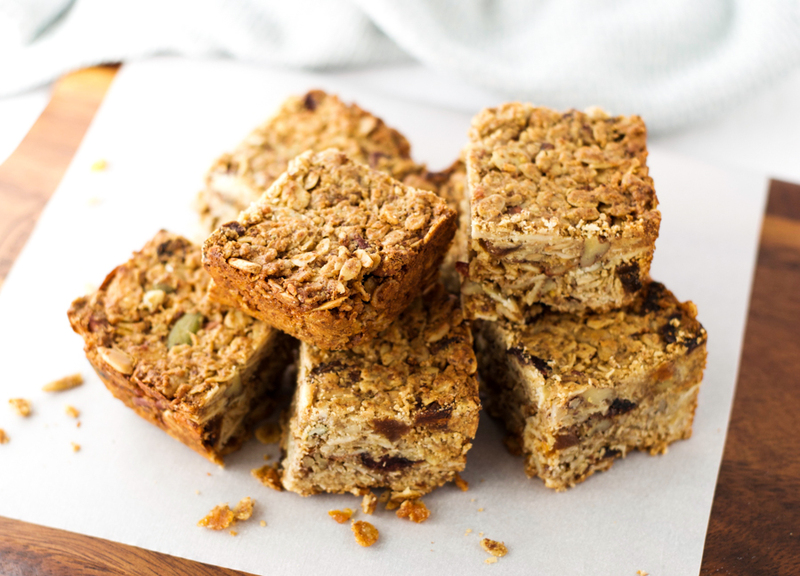 These gluten free fruit and nut granola bars are a tasty and nutritious way to get some healthy fat into your diet. But moderation is still key. Just because ‘fat is back’, it doesn’t mean we should be eating it by the bucketload. Preheat the oven to 350F and grease a 9 x 9 baking tray or line it with parchment paper. In a large bowl, combine the oats, sugar, blended oats, cinnamon, flax seed, nuts, seeds, and dried fruits. Put the almond butter, butter, maple syrup, and water into a small pan over a low heat. Warm and stir the mixture until it is melted and well combined. Pour the wet mixture on the dry ingredients and mix well. Put the mixture into the prepared baking tray and press it down. Place a piece of parchment paper over the top, and use a book or another baking pan to press down on the mixture. Remove the top piece of parchment paper (but save it), and place the granola bar mixture in the oven for 30 to 40 minutes, or until the edges are light golden brown. Remove from the oven, place the spare piece of parchment paper on top of the granola bars, and press down again with a book or baking pan. 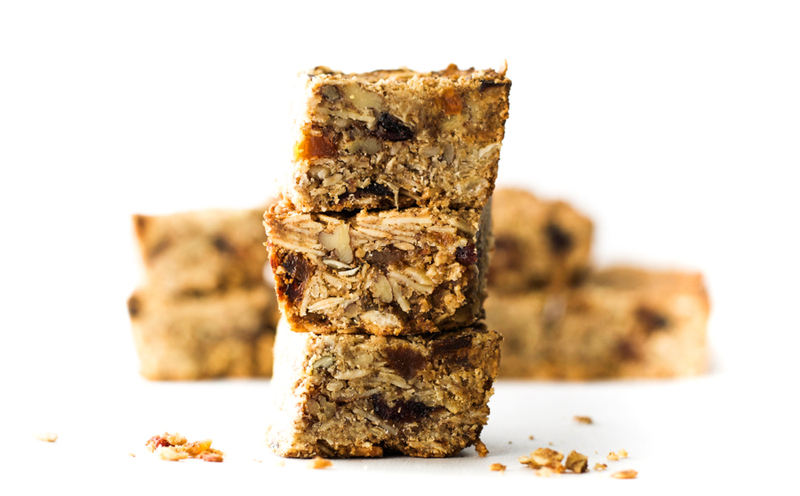 Allow the granola bars to cool completely in the pan before cutting (this is crucial otherwise they will crumble and fall apart). Once the bars are completely cool, remove them from the pan and cut into squares. 1. Cut the bars into individual portions. 2. Wrap each bar in a small amount of plastic wrap. 3. Place the wrapped bars in a ziploc bag flat in the freezer. 4. When you want to eat one, take it out, leave it to defrost for about 1 hour, and enjoy. 5. Alternatively, pop a frozen bar in a lunch box and it will be defrosted by lunch. It looks like you are very generous with your snack bar sizes. About 7 cups of ingredients for only 16 bars. More like a meal-on-the-go. How big are they size-wise? You’re right. 16 servings of this recipe is generous. I make them in the 9 x 9 pan so they are pretty thick and make a very substantial snack or breakfast. Size-wise they are 2.25 inches long and wide, and about 2 inches thick. I usually make these for my children as a breakfast food, or for postpartum/breastfeeding mum friends. If you want a smaller snack, you could make them in a 9 x 13 pan and cut them into either 20 bars (232 calories each) or 24 bars (193 calories). 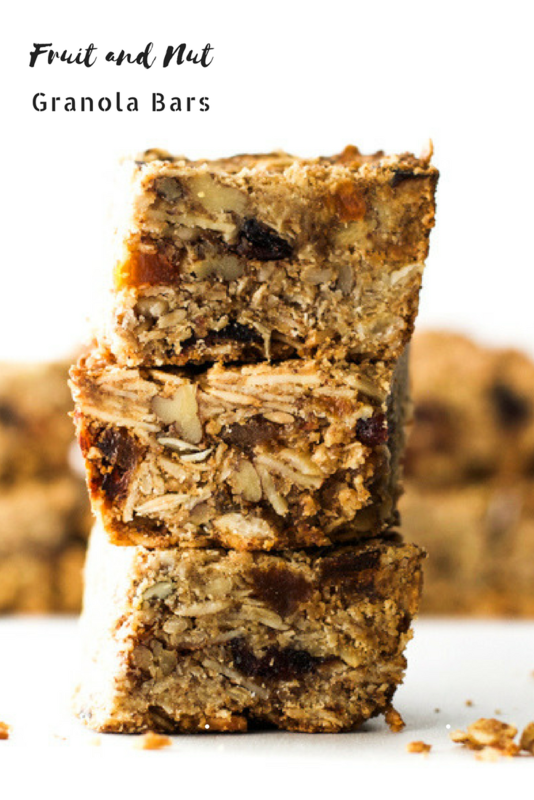 I’m a huge fan of homemade granola bars for my daughter to take to for her lunch or after-sports snack. Thanks for sharing your recipe at the Healthy Living Link Party!